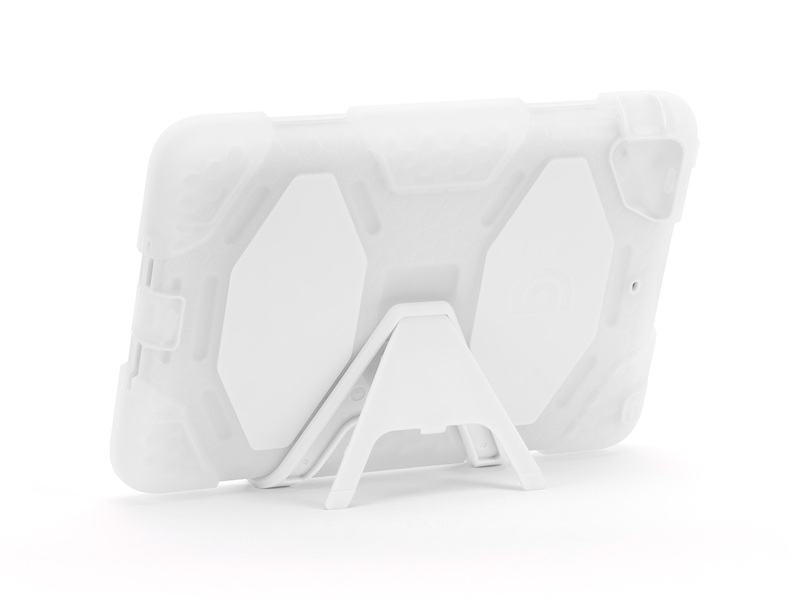 Survivor for iPad mini, clear/white | Qompu™ | technology. We think it’s a little bit of both. Simply put, the Griffin Survivor Case is the most protective case we’ve ever built. Tested and certified to meet or exceed US Department of Defense Standard 810F, Griffin’s Survivor Military-Duty Case is designed from the inside out to protect your iPad mini from extreme conditions… dirt, sand, rain, shock, vibration and a host of other environmental factors. Survivor is built on a shatter-resistant polycarbonate frame clad in rugged, shock absorbing silicone. A built-in screen protector seals your Multi-Touch display from the outside environment, while hinged plugs seal the dock connector, camera lens, headphone port, hold switch and volume controls. The included stand clips on, then folds open for landscape viewing and typing. Survivor is independently tested and verified to meet or exceed environmental testing standards for blown rain, blown dust and grit, vibration, shock, temperature and humidity. You can view videos and test results online at www.griffintechnology.com/survivor. Price: $ 59.99 Read More and Buy it here!